North West time out photo proves all that is well and good in a Kardashian. Only the glittering offspring of Kim Kardashian would turn a time-out into a day spa. Just in case you were wondering if North West was like any other regular toddler, she’s, ah, not. Because when Kim Kardashian West posted a photo of eldest daughter North basking in her own DIY day spa on Tuesday, she did two things. Firstly, she confirmed all that is well and good in a Kardashian and how decadent luxury doesn’t stop at the second generation of a family of reality TV stars. And secondly? She gave away the title for most outrageously brilliant family member to her three-year-old daughter. 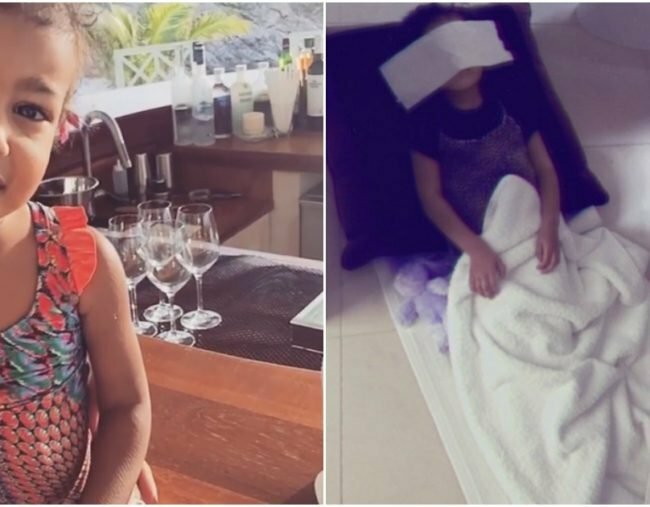 “That time North gets a time out [and] is a little too quiet… I go in her room to check on her [and] she’s in the bathroom, made her own spa [and] tells me she’s chilling out,” Kardashian West posted on Instagram and Twitter alongside a photo of three-year-old North lying in her at-home day spa. Glamour, it seems, seeping through the Kardashian blood stream faster than North has time to pinpoint exactly why she needs her chill out time in the first place. It’s not the first time the reality TV star has suggested North may be the homegrown talent they need to expand their empire. Just this month, Kardashian West told Ellen her daughter is a lot like her father. She went on to add that North has all the power in the sibling rivalry too. If this is even an exaggerated version of the glittering character North West has the potential to be, hold onto to your Kardashian tolerance just a little bit longer. These guys aren’t going anywhere.